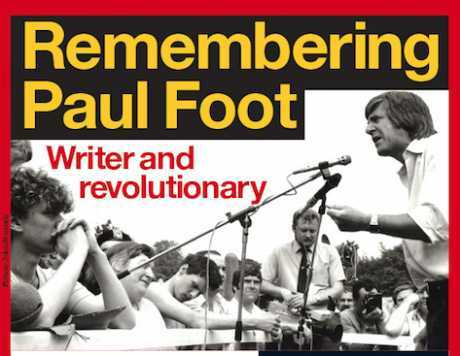 Ten years after his death, investigative journalist Paul Foot will be remembered at a special memorial meeting next Saturday. Foot was a tireless fighter against injustice, winning several awards for his campaigning journalism on behalf of people who had been wrongly jailed. A lifelong socialist, as well as editing Socialist Worker for a period, Foot spent 14 years writing an investigative column at the Daily Mirror, enjoyed three lengthy stints at Private Eye and in the final years of his life also wrote a column for The Guardian. He died in July 2004 of a heart attack, aged 66, and is buried in London's Highgate cemetery, quite close to the tomb of Karl Marx and next to Chris Harman. The speakers at the memorial meeting will be four people he admired and who admired him in turn. They are journalist John Pilger, civil liberties campaigner Darcus Howe, lawyer Gareth Pierce and Matt Foot, one of Paul's sons, who is also a lawyer. The meeting is part of the five-day Marxism Festival organised by the Socialist Workers Party. It takes place on Saturday 12 July at Logan Hall, Institute of Education, starting at 3.45pm.